Researchers at the University of Illinois are working on robots that could bring your medicine to you in your home. A $1.5 million grant is helping cover the costs. Engineers already have working prototypes in their lab. In the next 15 years, the elderly population is expected to double. Researchers say all those people are going to need extra help to avoid overcrowding nursing homes and assisted living centers. Their project is just one of many technological advancements on the horizon. The UIUC mechanical science and engineering professor got a $1.5 million National Science Foundation grant this summer to fund the development of robots that can assist the elderly with daily tasks, in a project called Automation Supporting Prolonged Independent Residence for the Elderly, or ASPIRE. These robot drones could deliver pills from the cabinet or help with cleaning. She received an additional $300,000 grant to lay the groundwork for Non-Intrusive, Collaborative, Empathetic, Robust (NICER) robots, with an aim to understand peoples’ perception of robots. … A roboticist from the University of Illinois was recently awarded a $1.5 million grant from the National Science Foundation, which she will be using to design drones that can help around the house. According to , Naira Hovakimyan is putting small drones to work and testing how they can perform common tasks, like retrieving a medicine bottle from a different room. The world is moving more toward automation every day, and she says that drones could be a regular part of the elder care system in a decade or two. ‘I think that it will take another 15-20 years to integrate such technology in our lives at affordable prices,’ Hovakimyan told Dailymail in an email. A roboticist from the University of Illinois was recently awarded a $1.5 million grant from the National Science Foundation, which she will be using to design drones that can help around the house. According to The New York Times, Naira Hovakimyan is putting small drones to work and testing how they can perform common tasks, like retrieving a medicine bottle from a different room. ” Another important breakthrough has also recently been discovered by researchers at the University of Illinois in Urbana-Champaign. The article, published on the University’s news site last March, states how the implications of this discovery are dramatic to airplane and aircraft safety. Naira Hovakimyan, a professor at the university, announces her team’s highly successful test of the Hovakimyan’s L1 adaptive control technology on a manned army aircraft, which should be an important step towards the technology’s introduction into commercial aviation. Read more at: Eurek Alert! Dr. Hovakimyan was interviewed by the Big Ten Network on her research and the Humboldt Research Award. Read the full story here. 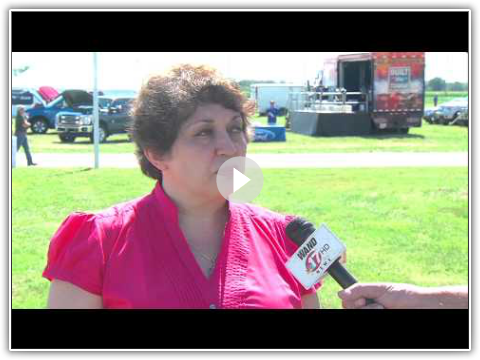 Dr. Hovakimyan was interviewed by a reporter of WAND TV after her presentation at the 2014 Precision Aerial in Progress City, IL on July 10, 2014. Dr. Hovakimyan was interviewed by the UIUC News Bureau regarding her prestigious Humboldt Research Award. Read the full story here.